This new edition presents a comprehensive, up-to-date survey of the concepts and methods in contemporary condensed matter physics, emphasizing topics that can be treated by quantum mechanical methods. The book features tutorial discussions of a number of current research topics. Also included are updated treatments of topics that have developed significantly within the past several years, such as superconductivity, magnetic impurities in metals, methods for electronic structure calculations, magnetic ordering in insulators and metals, and linear response theory. 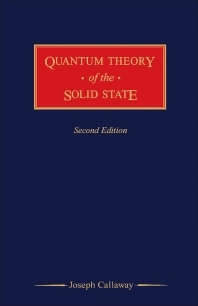 Advanced level graduate students and practicing condensed matter physicists will use the second edition of Quantum Theory of the Solid State as an important source of information. Advanced level graduate students and practicing condensed matter physicists. Electronic Structure. Lattice Dynamics. Symmetry and Its Consequences. Phenomenological Theories of Magnetic Order. Impurities and Alloys. External Fields. Electrons, Phonons, and Transport. Aspects of the Electron Interaction.